Jade is a polycristalline aggregate made of fine and very densely interwoven mineral grains or fibres, which give it its outstanding workable properties. Based on historic references, the Chinese understanding of the term jade is not equal to the Western understanding of the term, which has been defined (CIBJO) to consist either of jadeite (mineral of the pyroxene group) or nephrite, an intermediate member of the solid solution series between actinolite and tremolite (amphiboles). In the Chinese understanding, the term jade was historically separated into the terms Ying Yù (hard jade), mostly corresponding to pyroxenitic jade (also known as “Fei Cui” 翡翠) and Ruan Yù (soft jade), which apart from nephrite also includes minerals of the serpentine group (Xiù Yù jade, Henan). For more information, see this article. As a gemmological laboratory with a scientific approach, we strictly use mineralogical and chemical parameters to identify jade, either as jadeite-jade or nephrite-jade and to disclose any treatments applied on these stones. In the following the wording on reports is explained using jadeite-jade as an example. The SSEF report number is the number given to the jade item when it is submitted for testing, and is a unique number. If an item is resubmitted later for a ‚recheck‘ after re-cutting or for a report update then the item obtains a new report number. The photo of a jadeite-jade piece depicts the gem at the time of testing. The photo on an SSEF report is for representational purposes and does not necessarily represent actual colour, clarity or size. For size comparison purposes, approx. magnification used is provided under the photo on the report. Weight of a jadeite-jade piece in carats, measured and stated with 3 digits. In the case of mounted jewellery, total weight corresponds to total weight of jewellery item(s) and is stated in grams. Estimated weight is an estimation -for example- for stones mounted in jewellery. The actual weight of a stone can only be weighed unmounted. The shape and cut describe the outlining shape and cutting style of an examined gemstone. For jewellery items with several stones, if these vary, a range of shapes and cuts may be stated. 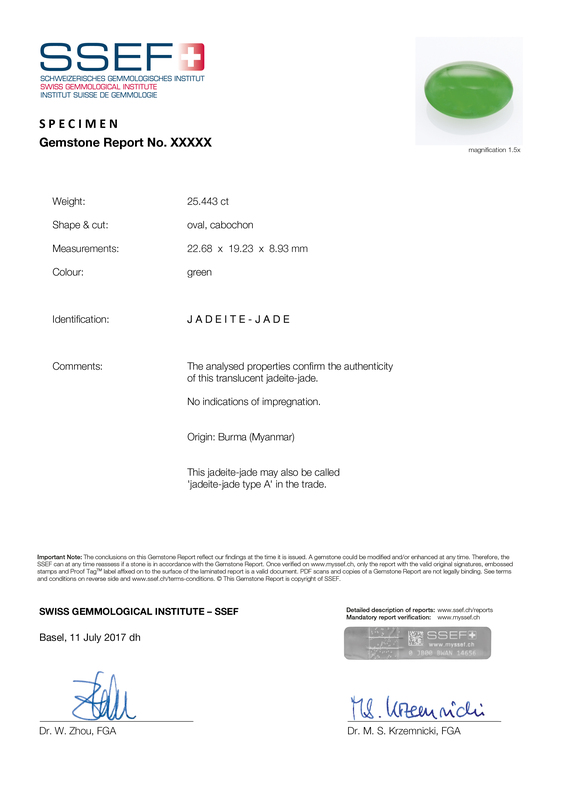 The colour description of jadeite-jade on an SSEF report describes the colour hue (such as green, light green, white, brown, light purple) of the examined item(s). In case of inhomogeneous colour, the range of colours is stated. If the studied gemstone is found to be jadeite-jade it would be stated in the Identification section as ‘Jadeite-jade’. When found to be nephrite-jade, ‘Nephrite-jade’ would be stated in the Identification section of a SSEF report. No indications of impregnation. This jadeite-jade may also be called ‘jadeite-jade type A’ in the trade. Impregnated with wax/oil/artificial resin. This jadeite-jade may also be called ‘jadeite-jade type B’ in the trade. Dyed. This jadeite-jade may also be called ‘jadeite-jade type C’ in the trade. Dyed and impregnated with wax/oil/artificial resin. This jadeite-jade may also be called ‘jadeite-jade type B+C’ in the trade. If the material corresponds to the latter two cases, then it would be disclosed as ‘Treated jadeite-jade’.